Description: Amtrak #8 'The Empire Builder' at the depot. Title: AMTK 39975 "Willamette Valley"
Description: First run on Coast Starlight #11 since being refurbished and given the name "Willamette Valley." Description: No question where this shot was taken. These Ex ATSF hi-level cars only operate on the Coast Starlight and there's only one Albany on that route. Description: An EX ATSF El Capitan Highlevel now lettered for amtrak and named "Willamette Valley". 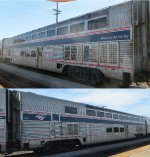 This car is part of the Coast Starlight's 1st class (sleeper class) ad was renovated twice since Amtrak aquired it. Description: View of the chair end of the car. Description: AMTK 39975, the Pacific Parlour Car "Willamette Valley", rolls by on Coast Starlight train #11 as it departs Emeryville. Description: AMTK 39975 "Willamette Valley" observation car... although shes had some of her advertising by the door painted over, so unsure what that means - along with a slightly non-standard access hatch appearance. On a southbound consist rushing into Vancouver Station on a winter Saturday evening. Description: AMTK 39975 "Willamette Valley" observation car in the fifth slot - and I probably shouldve just settled for the February lateral view, but theres something neat about those curving windows at the top.